Growing your own herbs always seems to make it onto the 'Top 10 beginners tips for sustainable living' tips but sometimes I wonder whether chucking a few leaves on your plate is having any measurable impact. Its hardly achieving self sufficiency but when you do consider the cost every time you spend $3 on a bunch of herbs at the supermarket, combined with the footprint of transport, refrigeration, the little plastic sleeve and the inevitable waste that comes at the end it all does have the potential to add up. I am now convinced its smaller critters at work....... 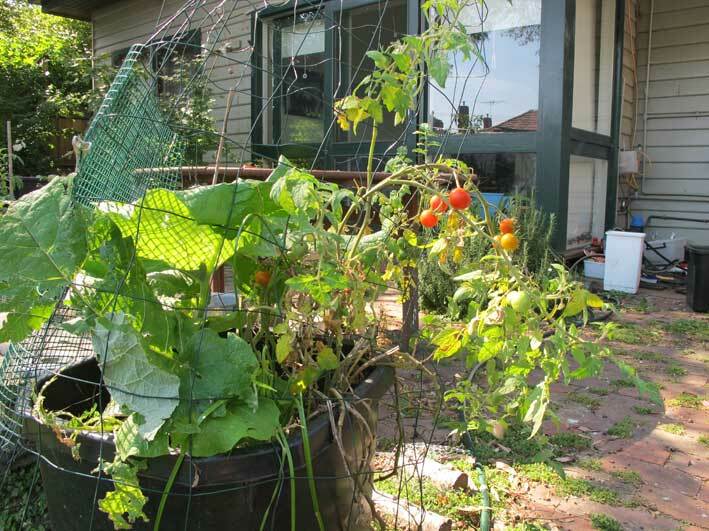 I have come to the conclusion that growing things in pots needs to follow the same theory as garden with regular 'crop rotation' to minimize pests taking control. So I am planning to re-pot this baby with some new soil on the weekend. I will give the dirt to the girls to poke around in, and give it break from growing. It seems lately that a day doesn’t go by without an article appearing in the media that waxes lyrical about Diggers and their heirloom seeds. Take this article from the Age the other day. But do you really need to pay $49 to become a member of the Digger’s club to have a productive and sustainable garden? I must admit briefly flirting with the Diggers concept with the purchase of some Diggers heirloom tomatoes. Last year was my second attempt and I went all out with the full mixed punnet (Black Russian, Tigerella and Mortgage Lifter) I think they were accidentally under priced so it seemed like a bargain at the time. This was at the expense of other varieties I have planted in the past. Blame the weather or the fact they were planted out in October, but I think I had a grand total of about 3 tomatoes! The only tomato that did come through was the likely certified commercial hybrid cherry tomato that’s still feeding the family this year. Not to be deterred I undertook to save the seeds of a single Black Russian (along with my hybrid cherry) to produce this year’s crop. While the cherry tomato and its descendants are coming along I am yet to be impressed by my ‘Diggers’ descendants. Its also worth noting Diggers doesn’t have a moratorium on so called heirloom seeds, many of the seeds advertised in the catalogue are available through cheaper brands like Yates and Mr Fothergills or are sold as seedlings at Bunnings (even under the budget labels!). 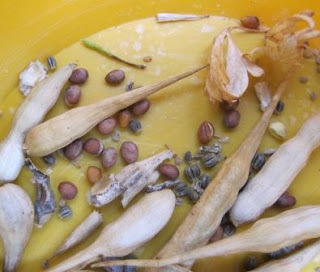 I have been growing seeds from the same $2.5 pack of Mr Fothergills version of Diggers ‘Blue Lake’ climbing beans for ages and now I have moved onto their babies (bean and pea seeds must be some of the easiest seeds to collect and grow). Despite all of this I did have to thank one friend’s dalliance with the Diggers cult when I harvested my second crop of Daikon (Japanese radish) seeds today….. I will have to admit I don’t think these ones are for sale down at Big W.
It’s a tricky time of year to take on the challenge of a waste free kitchen. The holiday season brings unexpected social outings and activities and the warmer weather (although you wouldn’t believe it this week) tends to encourage a less structured and flexible routine. It doesn’t help that the market is heaving with delicious seasonal produce at bargain prices. So this week I focused my efforts less on my garden challenge and more on what to do with everything in my fridge. I generally have a set way that I plan my cooking and shopping for the week ahead. I set menus Saturday through to Thursday, with Friday designated 'take it as it comes'. More often than not it’s a case of taking a pizza base and adding a home made topping. This week it's left over salami, with onions, capsicum and home grown tomatoes. Unfortunately I made the sad discovery of a tub of Mt Zero olives I bought before Christmas- but have now gone mouldy - such a waste! In addition I always make sure I have at least one meal that can be flexible and held over to the following week if things come up. A favourite is Thai Curry as I usually have some chicken in the freezer and just use whatever veg is around (onions, carrots and capsicum keep – so they are staples in my cupboard and fridge). This week I made Penang curry with some left over roo fillet that was languishing in the freezer. This week I also decided to get back into my after work swimming routine so I need to ensure there was one meal that only needed to be heated and ready to serve. A perfect dish is Karen Martini's fantastic apricot chicken recipe (taken from the Age Sunday Life magazine). Dry roasting coriander and cumin, grinding the spice mix and browning the chicken takes a little time so it’s a great dish to cook on weekend and enjoy the leftovers mid week. It also gave me an opportunity to try out our new season chillies. 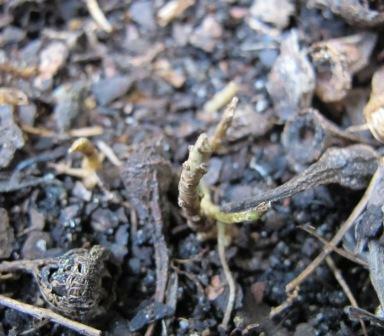 I will confess I am not responsible for chili growing – as that’s my partner Glenn’s job. 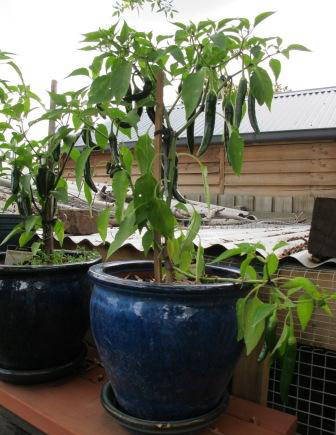 Last year he didn't get much joy with the seed saved chillies given last year’s mild growing season so it was off Bunnings and Masters for some new seedlings. I approached the chillies labelled ‘Kaysan’ with a certain degree of caution but turns out despite the label marked hot they were no hotter than the green chillies I normally buy. I am looking forward to making some of Hasan M’Souli’s green harissa soon. This afternoon I fought the chooks off to pick this beautiful punnet of berries. (The girls are obsessed with raspberries and stand at the fence whining and waiting for the cast offs- the berries that have been left to long and withered or been attacked by whatever).This is pretty much what I have been collecting now on a daily basis well over a month (or more?!). Raspberries are my favourite fruit and we have been enjoying them every day- chucked onto whatever other deserts I have cooked up, with pancakes or by themselves. Dollar spent for dollars worth produced, the raspberry canes have been one of the most beneficial additions to garden. I think all up it would have cost me about $8 for the 2 lots of canes I bought (one from a Japanese gardening guy at the Japan festival- who also sold me my first Japanese burdock plant) and a pack from Bunnings which I think the current lot are descended from. 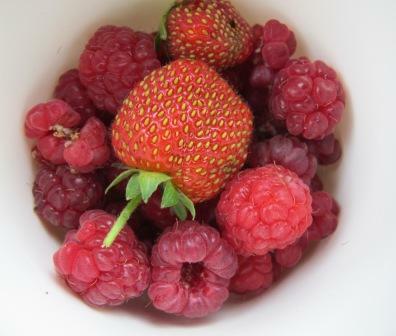 In all I would have grown punnet upon punnet this year and at an average price of $4 a punnet thats not a bad investment! Amazingly the strawberries have also managed to produce.. despite the damage done by the girls when I let them sun bake in the corner over the winter and despite being taken over by the raspberries. I think I they have been helped along by being dug up, replanted and given a good fertilise with the chook poo. Not to mention careful placement of beer traps to kill off the resident slugs. But anyway it seems nowadays chooks are the must have suburban backyard accessory... I am not going to admit to jumping onto the trendy hipster bandwagon- because it was my idea first! 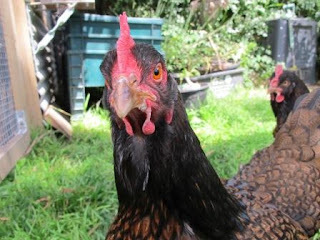 But I will admit to my choice of chook breed came directly from being too obsessed with SBS Gourmet Farmer. 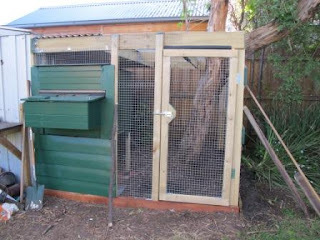 The first step that delayed getting the chooks for a long time was finding somewhere to put them- this problem was solved when the top half of struggling wattle/accacia up the back snapped and we decided it had to go. This freed up enough space next to the shed- which had the added bonus of providing a secure wall to one side of the enclosure. The cage is a mix of new and scavenged materials that gave Glenn a few weekends worth of DIY excitement. The next stage in the process was securing the chickens. We found a breeder by the name of Hazel who advertised on the Backyard Poultry website. Hazel was happy to invite us down to her property at Bannockburn to collect our babies. She led us into a shed with the broody boxes and we were presented with half a dozen chicks to choose from- scooped out of the broody box with a net! I grabbed 2 largest chicks and so it was we became chicken owners! 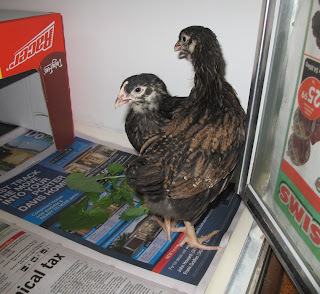 As for naming the chicks as they were supposed to be livestock not pets so we didn't set out to name them at all. Unfortunately the practicalities of differentiating the who's who meant the chickens named themselves. Boss got her name as she was the leader of the 'flock' since day one. Boss would be the first to try new things and the chick who would take the lead when it was time to go to bed. Poor Spazz on the other hand seemed to struggle a bit at the start... she got her name as her feathers on her wing are often sticking out sideways and an early lesson in flying seemed to end badly when she refused to jump off the perch. Now shes a fully grown chook - shes not the boss in the leadership sense but she certainly is bossy... her technique is to grab onto what ever tasty morsel Boss has has found and push her out of the way so Boss doesn't get it back. The last of the Christmas ham. 1 left over zucchini that I stripped into ribbons using the vegie peeler. some dubious 'You'll love coles' pesto sauce - left over from one of the Japanese girls who periodically come and stay. I was thinking about starting fresh but couldn't have been bothered going to the supermarket to get some pine nuts and figured aside from using up the waste I could tart it up with home grown basil. home grown tomatoes, fresh black pepper and the ham. The end result was fresh and light, a perfect end to the Christmas ham and a hot summers day. I have been planning this blog for sometime now... but like many things on the 'to do' list has to wait around until lazy day over the Christmas break... Now's not exactly the best time to start documenting my challenge as there is not much coming out of the garden. The last of the winter crop- the belated snow peas and Japanese daikon are well and truly finished and the girls are now on summer holidays thanks to a pre-Christmas bout of broodiness! The summer vegies (tomato, eggplant, climbing beans and capsicum) are yet to deliver but are all thriving and showing positive signs of bountiful harvest to come... Thankfully the sweet basil and the thai basil have been thriving too and providing good pickings for summer salads and the amazing tomato that sprung up out of the Japanese burdock pot last year miraculously survived the winter and is now providing the odd tomato or two. The real standout for the summer has been the raspberries... after years of drought, last year the rain sent them ballistic! As they fruit on the last years canes... its taken until this year to really enjoy the harvest. The rains this year have ensured I have had bucket loads of them and the new growth means despite the fact I am going to need to do some major thinning (raspberry canes anyone?) next year will hopefully be equally abundant.